Lion is one of those films that is as pure in its intentions as it is obvious in them. There is no hiding the fact that this "based on a true story" Oscar-hopeful adapted from Saroo Brierley's account of his own journey in the book, "A Long Way Home" is meant to be anything less than an inspiring and uplifting experience. The good news is that those intentions are so genuine that one can't help but to be unconsciously or willfully manipulated by the emotions the film plays on. That is to say, if one is willing to submit themselves fully and without any kind of pessimism or outright cynicism then Lion is a treat that will garner your investment first in the life of its protagonist and then in their plight. There aren't many flourishes here and the storytelling is rather straightforward and predictable, but there is something to the way that director Garth Davis moves through these familiar beats that lend them such an authenticity that it never feels as if the movie is attempting to create false emotion where none exists. Rather, it is simply presenting the facts of a story that elicit such natural responses. There is nothing overly exceptional about the film and Davis doesn't exactly place a particular visual or directorial style on the piece, but rather Lion is very much a middle of the road awards contender that appears to be little more than as much based on its story and credentials. It is able to transcend such labels through the process of the otherwise humbling experience it creates. 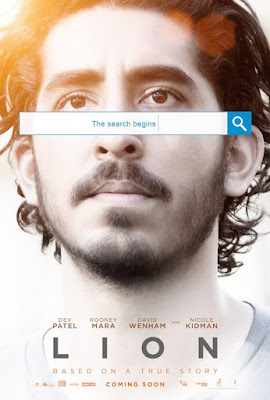 Much of the films heavy lifting is done in the first half where Saroo is portrayed as a child by the infinitely precious Sunny Pawar as opposed to the second half where face on the poster Dev Patel (Slumdog Millionaire) searches for interesting places for the script to take him as his more matured Saroo deduces his place of origin through the help of the then just-launched Google maps. It's not so much that the second half of the film falters, but more that it is never able to keep pace with the more insightful and moving first half. Given we become so invested in Pawar's performance and Saroo's predicament though, we're naturally inclined to be interested in the details of how his story wraps up. It is in this conclusion that Lion shows its greatest strength in that all that has come before truly pays off in the most affecting and sincere of ways. Guddu (Abhushek Bharate) and Saroo (Sunny Pawar) journey home with milk to help feed their mother and sister. Adapted for the screen by Luke Davies (Life) Lion tells the story of Saroo Brierley who was once a five-year old boy who got lost on the streets of Calcutta. This happened thanks mostly to his reluctance to stay at home when his brother Guddu (Abhishek Bharate) left for work and Saroo insisted he go with him. This work took Guddu and Saroo to the barren subway stations of India in the middle of the night where, after a long train ride, the young Saroo was tired and the not much older Guddu had to go to work; realizing he shouldn't have brought his younger brother despite his wishes. This would ultimately be a decision that would serve as the catalyst among all catalysts as the lives of both Saroo and Guddu would forever be changed due to both admirable traits and the inability to say no. On this fateful night Saroo is left to sleep on a bench at the station while Guddu goes off to work. Five-year old Saroo wakes hours later unable to recall where he is or where his brother has gone. Getting up and immediately calling out for Guddu the young Saroo searches everywhere including an empty passenger car in which he again nods off in. Upon waking up this time Saroo finds the train to be moving-taking him somewhere only God knows and where Saroo will certainly have no idea how far he's gone from home. It is in this furthering of the distance between Saroo and his loving, appreciative mother that the stakes of Lion continue to grow and grow. Davis recounts instance after instance in which both the mental and physical strength of the young Saroo is put to the test as Pawar displays both a strong will and resourcefulness for a boy his age while at the same time wearing a constant look of hopelessness that will crush even the coldest heart. Through a series of circumstances that Saroo is truly lucky to fall into he is adopted by a couple in Australia (Nicole Kidman and 300's David Wenham) where he goes on to live a privileged life. The couple end up adopting a second boy from India, Mantosh (Keshav Jadhav and Divian Ladwa), who is damaged in the sense Saroo again has to step up to drown out his own issues and troubles in order to guard his mother's heart. Moving twenty years into the future Saroo (now played by Patel) readies himself to enter the professional work field with a girl he loves by his side (Rooney Mara) when he is reminded of his home and a longing to locate it becomes inescapable. It is upon reaching this second hour of the film in which Patel takes over the role of our protagonist that the film loses some of its muster. This is not due to Patel, Kidman, Mara, or Wenham giving especially bad performances as each do a commendable job with the difficulties their characters encounter. Rather it is the pacing of this second half and the inevitable comparison of troubles that the young Saroo faced that make the amount of whining and moping about that the older Saroo does seem uncharacteristic and slightly maddening. Davis establishes, and I'm sure this mentality is evident from Brierley's first-hand account in his book, that Patel's Saroo has accepted his cushy lifestyle and the glowing prospects his future brings-displaying he has more or less put behind him any thought of where he came from or the family he lost. This is key to understanding the amount of guilt Saroo later feels when he considers how his mother and brother who likely blamed themselves for his disappearance must feel every day-blaming themselves for the fact they will likely never see their son and brother again. Davis, as well as Patel's performance, make it clear that Saroo is experiencing something quite profound when he tastes a desert at an Indian-themed party that sparks a memory of the hometown he mispronounced and that no adult could then find on a map. This spark of a memory is only the tip of the iceberg though, as this reminder to Saroo that he had a life before being brought to Australia and what and who that entailed rocks him to the core. Davis is given the unenviable task of conveying these emotions that could bring anyone to a standstill through a moving, visual medium and thus the reason the second half of the film feels like it sometimes intentionally stalls. True to Patel's Saroo it's as if the movie has as much to figure out about where it's going as he does. While this gives a sense of the confusion, the longing for certain outcomes, and the like to the viewer it also gives hesitance to fully get on board with a character we don't always feel convinced is a true extension of the young child we found great sympathy for. Once Saroo decides to dedicate his time and resources to the cause of tracking down his biological mother Lion begins to pick up the pace, but the relationship drama involving Rooney is ultimately unnecessary as is the amount of times Saroo goes back and forth about deciding whether or not to pursue this seemingly impossible journey. Had Lion given more weight to the conflict of Saroo telling his parents in Kidman and Wenham what he desired to do and that once he broke through that wall moved full steam ahead with his plan there might have been a more consistent pace overall which then would have also kept audience investment consistent throughout. Having gone through an emotional roller coaster Adult Saroo (Dev Patel) makes the physical journey to try and reunite with his family. Understanding that critics are to discuss the movie they saw and not the movie they wished to see though, it is easy to applaud Lion for all that it does accomplish effectively. For as much of that last hour can feel uneven the final fifteen minutes or so make it well-worth the investment both in your time and emotions. It is in these big moments that Patel captures the small emotions one couldn't ever anticipate feeling until being in the midst of such a moment. Part of the intrigue of stories such as this is the anticipation of not knowing what sort of emotions response those that are the subject of such experiences will have and while I hate to get too spoilery, but if you've seen any movie ever I'm sure one can guess the conclusion to Lion, Patel delivers a heartfelt showing of simultaneous joy and heartbreak. The memories or lack thereof that must have been rushing through the real Saroo's mind at the sight of his mother who had aged twenty-five years in the time since he last saw her must have been incomprehensible, but through Patel's emotive face we catch a glimpse of something there are still not words to justly describe. In short, Lion is a film that will shake you, that will elicit an authentic emotional response all while being rather standard if not handsomely constructed in its style. Thus meaning cinematographer Greig Fraser (Rogue One, Zero Dark Thirty, Foxcatcher) lends the film something of a subdued aesthetic that likens itself to grand emotional dramas of another decade whereas Dustin O'Halloran and Hauschka's score underpins what could easily be viewed as manipulations on such emotions with music that compliments the rich visual style and rich emotional investment the film asks the audience to take on. Lion is a competently made film that excels in welcoming the viewer into what will likely be a foreign world for most giving India a voice and distinct look that doesn't compare to the likes of Slumdog Millionaire or any other notable depictions of the country. To use the word again, there is a subdued nature, a somewhat haunting nature to how Davis presents his vision of India and how that begins to close in on the young Saroo. Of course, what will remain with the viewer long after the credits have rolled is that of the face of Pawar as his small, screaming voice that yells his brother's name is drowned out by the sound of the train on which he rides. A tragedy of Greek proportions wrapped in the culture of modern India the first hour of Lion and the earned emotional payoff make it one not to miss despite the stakes somewhat lacking in the muddled middle.